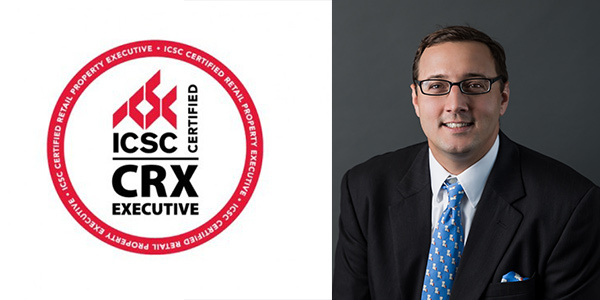 Stirling Properties’ Asset Manager, Ryan Juneau, has earned the ICSC (International Council of Shopping Centers) Certified Retail Property Executive (CRX) credential. With designees in 50 countries, ICSC’s certification programs raise the industry’s professional standards globally, and distinguish retail real estate professionals who demonstrate the highest levels of competency in their specialty as proven through solid professional education, experience, ethics, and the passing of a rigorous examination. ICSC grants CRX certification in recognition of mastering retailing and retail property knowledge related to the performance, profitability, and executive leadership of industry organizations. Only a select group of senior executive leaders are awarded CRX designations each year. Juneau is a member of Stirling Properties’ Asset & Property Management Division where he is responsible for ancillary development and construction, property operations, leasing, financing, financial reporting, and investor relations for internally owned, joint venture, and third-party managed assets. His portfolio includes both newly opened and mature shopping centers and office buildings in Lafayette, Baton Rouge, and Slidell, Louisiana, as well as overseeing management of the PMAT Companies’ portfolio of shopping centers across the southeast and mid-west. Juneau holds a degree in Finance/Real Estate and graduated from the Executive MBA Program at Louisiana State University. He also achieved the designation of ICSC’s Certified Development, Design, and Construction Professional (CDP). He is active in the Baton Rouge Area Chamber of Commerce and serves on the Board of Directors for GaitWay Therapeutic Horsemanship. Ryan Juneau can be reached at rjuneau@stirlingprop.com or (225) 329-0263.